PHOTOS FROM OUR FAST AND FURIOUS 6 WEEKS IN MAINE!!! Celebrating Katrina's graduation at the lovely home of Trav's Mom Ginger and her husband Tom. Don't pop the bubble! Hud and Viv in the fish tank at the LL Bean flagship store in Freeport. Moog and Nana happily pick rhubarb for the first of seven (that's right, SEVEN) pies Jen's Mom made for us while we were home. Her pies are indescribably delicious and one of the reasons our family gained a collective 31 lbs while we were in Maine. What do you think the chances are that we took them on on there offer? "Holy Crap they let you pick these things?" This is Applecrest Farm in New Hampshire's' guide to apples, and it seems they are still debating the merits of all the different apple types because all of the ratings signs are attached with hooks and can be easily re-positioned. Watch out, Ida Red, you can lose your "Very Good" status in a heartbeat! Jen and Kevin Ahearn, one of her very best childhood friends. She even wrote a play about how they met on the school bus. One of our former teachers brought this photo to our reunion. We think this is 6th grade. There's Jen (in the Mickey Mouse sweatshirt) while Trav observes her pumpkin decorating skills. Our beautiful fairy on her 7th birthday. Beating the crap out of a cardboard Minion pinata filled with a few pieces of candy is a formula for absolute fun for all ages. Viv got to celebrate her birthday many times. With Aunt Sarah (Jen's sister, who also has a summer birthday) at Jen's parents' house..
And with Trav's Mom and her husband Tom at the magical family camp on Moxie Pond (the home of Trav's favorite childhood memories, for which our boat is named). You can take the dog off the boat, but I guess you can't take the boat out of the dog. Sadie just spent the last six months on a cramped boat yet we bring her to the woods of Maine and she finds a cramped boat to spend the day in. While fly fishing with Dad, Hud hooked his fly on the end of a downed tree and was prominently sent "out on a limb" to retrieve it. Hud was thrilled (and both he and Trav were surprised) that he retrieved the fly without breaking the branch. Google now (or right after reading our blog and sharing our blog with everyone you know) the "Lost Kitchen" in Freedom, Maine. This place added a whole new perspective on all future and past dining experiences. The four year old restaurant is located in an historic water powered grain mill in the middle of nowhere in a town of 700 people. And on the first day of April every year they open up the reservations phone line and fill up for the entire year in less then twenty four hours. Last year they had so many calls on reservation day that they set off an alarm to the area emergency dispatch that notified the fire department that the phone system was overrun and no call could come if there had been an emergency. This restaurant is life-changing good. Jen and Heather Gautschi, her "Swiss Cousin" and best friend since they were 10. These two met on the first day of rehearsal for a production of Annie. At Funtown/Splashtown with Trav's brother Dawson, our sister-in-law Kellie, and our lovely niece Kyli. Take a second and read the warning and rules sign that Funtown thinks is necessary for this miniature canoe ride. There are 8,000 rules and warnings, leading us to think that perhaps Funtown would be more comfortable if Vivian just viewed the ride from a safe distance (but us being a family of risk takers we said "Viv, just go for it") Vivian was actually reprimanded by a Funtown employee right before this photo was taken for excessive buttocks movement that resulted in a slight, gentle rocking of the boat. "Don't rock the boat, little girl!" Hud, Viv, and Jen's Dad picking blueberries in the backyard of the house Jen grew up in. See the caboose? Jen's Dad bought it from the railroad when they were kids to be a playhouse for she and her brother and sister. 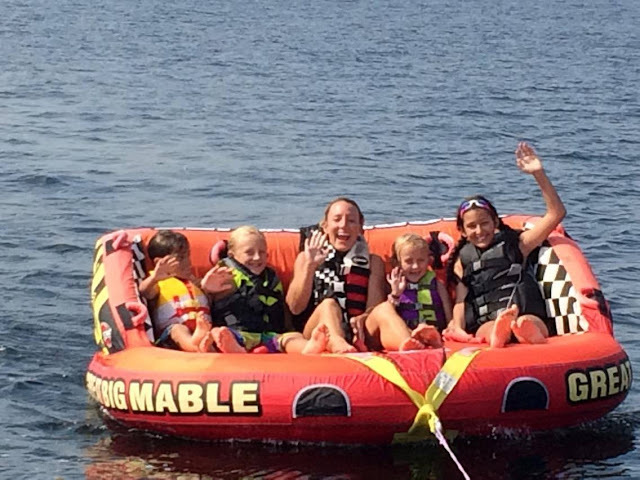 Tubing on Great Pond In Belgrade Maine with Sophie and Charlie, Trav's cousin Cassie's wonderful children. Maine wild strawberries! Thank you Vivian and Sandy. Vivian and her Great Great Aunt Roberta. in Springvale, Maine. We love you Aunt Roberta! Hud and Viv with Jen's wonderful friend Stacey's daughters, Maya and Chloe. This crew became insta -friends when they met last summer and we wish wish WISH they lived closer to each other. This photo was taken after their spontaneous musical concert which they performed at a custard stand. P.S. They were extremely good, in our unbiased opinion. There's nothing like floating around in giant plastic balls! 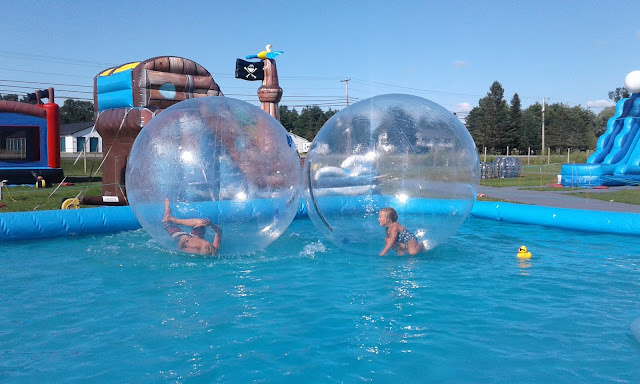 At Benton Fun Park, Maine. Here are Hud and Viv (and Sadie!) on a float at the GORGEOUS Rhode Island home of our friends, the Mills Family. We met them sailing in the Bahamas and our children are now lifetime friends. One of their daughters is even named "Moxie". Viv and Marley Mills in Lego heaven. The Harbor in Luperon, Moxie's home until hurricane season ends. Before we left for the US, we were all taking windsurfing lessons from Josh, a lovely Irish lad. He's been a great teacher and we've all had so much fun learning the sport. Moog Power in wind surfing action! Some of the things we love most about traveling are all the little differences. Like garlic and motor oil, side by side on a shelf at the store. This is Luciano, he owns LG Surf Camp where we rent our gear. Luciano holds the title of MASTER OF THE OCEAN- it's an X-Games type of competition involving Kite Surfing, Wave Surfing, Wind Surfing, and Stand Up Paddleboarding, and LUCIANO WON IN ALL FOUR CATEGORIES. And he's totally humble about it . We asked him one day how it feels to be MASTER OF THE OCEAN and he was like, "Oh, it's no big deal, I grew up here with the waves and the water, so you know,..."
Here is Trav, getting a haircut in the coolest barber shop in the Carribbean. The place is called "Yankee's", and as you can see, it's a barber shop, a liquor store, and a bar. It has three walls, and is open on one side. That is a giant beer in Trav's hand. Just transporting a few plastic chairs on the highway, via motorbike. Reason #672 why we love the DR.
...and here's the dinner! Pasta with tomatoes and cheese sauce, and a lovely salad. ...and I swear we almost had two new pets. If we hadn't been headed back to the US in a few days it might have been too hard to leave them behind. Thankfully, the nice woman who manages the hotel/restaurant said she would adopt them if no one else did and that they would live a happy life right at her beautiful hotel. Phew. Not a great photo, but here's Hud about to take off kite surfing. He had a great run that day and kited super well, but the camera ran out of battery. The guy behind him is his wonderful instructor, Felix. Yesterday was an important day. It was our one-year anniversary of being official vagabonds, one whole year since we packed up our van (Marshmallow! ), locked our house in Telluride (for the first time), and hit the road as a traveling family. ONE YEAR. And so here we are, back in Cabarete, Dominican Republic, after returning from six fun and frantic weeks in the USA. It's been a rough week since we returned (more on that later), and it has been a pretty crazy past month and a half, and so we are now taking a biiiiiiiig giant breath as we re-settle into our lives here on the beach. Breathe in, breathe out. Pat the dog. Make a smoothie. Go for a run. Strum the ukelele. Breathe some more. Trav and I both grew up in Maine, and ever since we moved to Colorado 18 years ago, our annual trips home to New England have always been fast and furious, jam-packed schedules of excessive celebration, meaningful re-connection, and trying our very best to make enough time for all of the people we care about. It's always nuts (in a good way), and we always gain a million pounds (not so good, but worth it). And despite the fact that this time we were going home to TRUMP AMERICA (despicable, horrific beyond belief, awful beyond measure, vomit-inducing, shameful, not my president) we had a really great time. It was also very important for us to be in Maine this summer since a lot has been going on this year in Travis' family. While we were home, we celebrated the passing of Trav's grandfather. Arthur Julia, at his beautiful celebration of life. We also spent some wonderful time with Trav's Dad's wife Sandy, who is battling cancer with an enormous amount of grace, humor, and positivity. It was also really great to spend time with our amazing sister-in-law Kellie, who tragically lost her son Corey this year. Trav's grandmother Lilla suffers from dementia and lives in a nursing home. We visited her there every week while we were home. On our way back to Cabarete this week, a few remarkable things happened. Some were lovely and inspiring, and some were traumatic and scary. Because I enjoy list-making and for the sake of clarity, I will number them. 1. On the morning we were flying out on the red-eye to the DR, Hud woke up with several huge, nasty, pus-filled bumps on the top his foot. A few days prior, he had cut the foot by dropping a wakeboard on it, and then proceeded to put his foot into a wakeboarding boot and then started wakeboarding (we didn't clean the cut right away, a big no-no). The result was the worst skin infection I have ever seen. It was pure luck we were still in the US and that my sweet father, who happens to be a podiatrist, saw us that morning and treated Hud's poor foot. Five days and some serious antibiotics later, he is on the mend. 2. We are allowed to travel with Sadie on the plane, because she is our, AHEM... emotional support animal. (If you would like more information on this, let me know. It's a story.) On the flight from Boston to Santiago, we found that she was bleeding a bit. The next morning, she was having a really, really hard time peeing. A trip to our fantastic vet here in Cabarete produced a diagnosis: stress-induced urinary tract infection, most likely caused by all of the traveling. Five days and some serious antibiotics later, Sadie is also on the mend. 3. When we left the US we flew into Santiago, DR and arrived at 3 am. The next morning at the hotel breakfast, our waitress was bringing my coffee and spilled a carafe of scalding, boiling hot milk on Vivian's shoulder. Viv screamed in agony. I grabbed two glasses of iced juice from the table and threw them on her shoulder while Trav ran for more ice and the hotel staff stood around uselessly like deer in the headlights. Viv's skin immediately began peeling off and we knew it was serious. We put her in our hotel bed and began putting ice and cold water compresses on her burn while I ran to the pharmacy down the street. I did my best in broken Spanish and returned with ointments and painkillers I had questions about, so I called Tim Ahearn, brother of our childhood friend Kevin (as seen in reunion photo,above) at Winslow Pharmacy in Maine, who kindly gave his time and expertise to guide me through everything we needed to treat her burn. At the same time I was talking to Tim, Trav was getting in touch with our other pharmacist friend Tom Edge, who also helped us. We are so lucky to have so many friends we can call on in times of need, and most of all, we are lucky to have my Dad, who ALWAYS helps us in times of medical crisis. 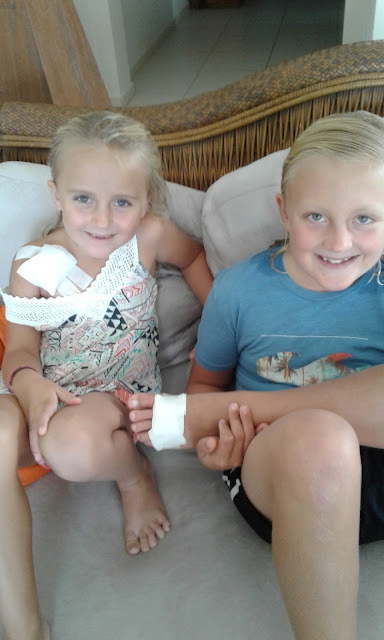 We've sent photos twice each day to update him on the status of Viv's burn so he could instruct us on what to do next and what to watch out for. The lady we rent our condo from brought us an aloe plant, which we've gratefully been utilizing. Poor, sweet Viv. She has been so brave. We are so lucky that it wasn't her face or her eyes that the milk spilled on, or that the burn wasn't larger. Her burn is healing, but it will be a long time before she can swim or be in the sun, and we hope that scarring will not be an issue. Breathe. Just before we boarded our flight to the DR, we ate dinner at Legal Seafood at the Boston airport. A tall African-American man, traveling alone, was seated at a table near ours. I said a quick hello to him as he sat down, but we didn't converse after that. We ate our dinner, chatting about nothing in particular. When the man left his table left he waved at us and said to Trav, "Have a good night.". A few minutes later, our waitress came and told us that the man had paid for our entire meal. We were dumbstruck. Tears came to my eyes. We finished our dinner and went in search of the man. When we found him, he was on the phone, and then he looked up and smiled. We thanked him profusely, and I asked him why he had been so generous to us, to strangers. He said, "I just thought you were a really cool family. And your kids are so smart. I thought you deserved a treat." We exchanged cards and learned that this man is a pastor at a church in Maryland.We will never forget his kindness, or how it felt to be treated by such a generous, unexpected surprise. And we will absolutely forward his amazing gesture of spontaneous and joyful giving. Yes, but she is healing really well. Thank you for reading!!! Thank you for sharing! Such an inspiring, positive read to start the day. I had tears from the part about the man secretly paying for your meal. You both have lovely families! Lots of love to you guys. Hope Viv and Hud are healing well! And you 3 are a truly lovely family as well! The gift from that man was huge-- we were super touched as well. Big hugs to you all and thank you for reading! OMG guys!! So sorry to hear about Viv & Hud & Sadie! What a lovely trip you had, though. We're really hoping to follow through on our threat to visit you in the DR this October!! <3 Safe(r) travels fam!